Sommeliers and other wine experts are leaving the restaurant floor in order to lead tastings at dinner parties in private homes. Here, a user's guide. In the past, the sole problem with america's best sommeliers—the sort who can reveal the story behind a wine as effortlessly as they pour a glass of it—has been that you could only find them in restaurants. But lately, more and more former top sommeliers are heading out to start their own businesses as traveling wine educators, hosting wine parties, classes and tastings in people's homes, and sometimes even bringing along a chef friend to turn the event into a full-fledged wine-pairing dinner party. The appeal of these gatherings, as Bay Area sommelier-for-hire Brian Cronin notes, is clear: "You're among friends, in the comfort of your own home. We're talking about a very personalized kind of attention." Here's a quick primer on the three main types of sommelier-guided tastings. If you already have an extensive wine collection, one option is to hire a sommelier to lead a tasting of bottles drawn from your own cellar. Generally, the sommelier will meet with you several weeks in advance, visit your cellar (or look through a spreadsheet of its contents) and suggest wines that will make for an interesting mix. Then, during the tasting itself, the sommelier will both pour the wines and lead a discussion about them, pointing out connections or differences that most people might not notice. Ralph Hersom, who in his last restaurant job directed the wine program at Le Cirque 2000 in Manhattan, specializes in these sorts of events, at least when he's not devoting time to his wine shop in Rye, New York, Ralph's Wines & Spirits. Hersom has staged a remarkable variety of tastings. He once led a tasting at a client's house in which each room had been transformed to represent a different wine-producing country—a French living room, a Spanish den, a California kitchen—with appropriate wines and cuisines. Hersom wandered from room to room like a senior diplomat, pouring, explaining and sharing anecdotes. More recently, he created a birthday-party tasting for Minky Worden, the media director for Human Rights Watch, at her Manhattan apartment. Worden is married to L. Gordon Crovitz, the publisher of the Wall Street Journal, and the couple has a substantial wine collection. Hersom staged a blind tasting of five pairs of wines. One pair was a 1993 Rehoboam (a 4.5-liter bottle) of Joseph Phelps Le Mistral, a California Syrah blend that the couple purchased at the Napa Valley wine auction a few years back, against several bottles of the 1998 vintage of d'Arenberg's cult Australian Shiraz, the Dead Arm. This allowed Hersom to compare Australian Shiraz with American Syrah styles, as well as show what happens to a wine as it ages, and get the guests talking about which wine they preferred and why. "It was my birthday, but I wanted something else to carry us through the evening," Worden recalls. "A dis­cussion of wine sustained us. A discussion of me wouldn't have." Cronin, a Master Sommelier who has worked at Charlie Trotter's in Chicago and Gary Danko in San Francisco, per­forms similar services in the Bay Area. "I like to wander the lesser-traveled corner of someone's cellar," he says, "and pull out some gem they didn't know they had." Sometimes he goes for more familiar wines, though. At the home of a local collector, he pulled out a 1997 Harlan Estate and a 1995 Château Margaux: "People can usually get the differences between wines, but it's even better if you can get them to see the thread that ties the wines together—like the great breeding and structure in both the Harlan and the Margaux." If you don't have an extensive wine collection—a category that includes most of us—sommeliers-for-hire are also perfectly happy to bring wines from a local wine shop. Often they will suggest wines they've featured on restaurant wine lists, or they'll focus on specific regions, grape varieties, vintages or almost any other facet of wine, entirely depending on the host's wishes. Since there's often a learning component to tastings like these, the sommelier will usually supply tasting sheets and printed background information on the wines. Whether you want to call this event a tasting or a class or something in between, the sommelier will need to meet with you beforehand to get a sense of your guests' level of wine knowledge. Gauging people's level of interest and then striking a balance between education and entertainment is the key to a successful evening, Cronin says, "though I think it's good to get people a little out of their comfort zone." Rather than serving Champagne, for instance, Cronin often pours a Sekt from Austria, an unu­sual sparkling wine. He also likes to pour Chenin Blanc from the French region of Vouvray, because "it more or less guarantees a conversation about balance. It has a honeyed sweetness without being too sweet, racy acidity and a minerality you only find in that region—it's one of the unsung heroes of the wine world." Having a physical focal point can also be helpful. Wine experts Tony Poer and his wife, Rachael, live in Napa, but they spent years in the restaurant world in San Francisco, where (among other jobs) Tony co-owned and ran the well-known wine bar Hayes & Vine. Now, when the Poers come to a client's home, they often bring their own portable wine bar. They roll it on its nonskid wheels straight from the hatch of their VW wagon to the living room, where, like a Chinese puzzle box, it unfolds into a full-size bar, complete with wine shelf. From this portable prop they pull out a half-dozen wines and a tasting cheat sheet that lists more than 60 wine descriptors. "Nothing fancy," Tony says. "It's designed for citizens." Since the Poers live in wine country, most of the wine they pour is made by their friends; Lang & Reed Cabernet Franc is one example. "We've known Lang & Reed's owners, Tracey and John Skupny, for a long time," Tony explains. "We've hung out with them; we know what Loire Valley wines inspired them." So he pairs the Skupnys' wine with their favorite Chinon (a Loire Valley red made from Cabernet Franc). "At that point, the evening's not about comparing two wines anymore," he says. "It's about two winemakers having a dialogue with each other." Though it's a more elaborate (and expensive) option, some sommeliers will work in conjunction with a caterer or chef. Typically they're hired as a team, and the chef and sommelier brainstorm together with the client to create a menu paired with wines—whether from the host's cellar or brought in from outside. Events like this can focus on the wine specifically, with the food (typically appetizers) as backup, or they can be multicourse sit-down dinners that might, for instance, pair different Burgundies with classic dishes of the region. Bonnie Graves is one sommelier who enjoys working this way. Formerly floor sommelier for the wine program at Spago Beverly Hills, she now runs her own wine consulting firm in Los Angeles called New Medici. Whenever one of her clients wants a meal to accompany her sommelier services, she calls on two old friends from her Spago days, executive sous-chef Mette Williams (now at L.A.'s Cut) and pastry chef Suzanne Griswold. The meals Graves and her chef friends devise are often sophisticated, with as many as six courses. At their last shared event, in Brentwood, Williams roasted poussins, then dressed them with a Niçoise oliveherb jus (which Graves paired with a Grenache from the Campo de Borja region in Spain), while Griswold baked a bitter­sweet chocolate soufflé crêpe topped with a Banyuls glacé (paired with Banyuls, naturally, from Domaine La Tour Vieille). "It's always better to work with talent you know," says Graves, "so you can gauge the caliber of the food-and-wine matching. I don't want to arrive with vintage Champagne and find out I'm working with pigs in a blanket." 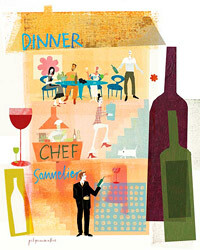 Manhattan sommelier Paul Lang effectively doubles as his own chef at his sommelier-for-hire bus­iness, A Casa. Lang spent some formative years as a private chef for a family in Italy and intended to start a restaurant when he returned to Boston, but chef Mario Batali got to him first. Batali persuaded Lang to move to New York and join the wine team at Babbo, where he served as a floor sommelier for two years. All the while, though, he kept recalling his experience in Italy—foraging for ingredients at local mar­kets and cooking on an intimate scale, in a home kitchen. "I kept thinking about all of those beautiful Manhattan apartments with kitchens that never get used," he recalls. "All those people who couldn't get into Babbo—I thought I could bring Babbo to them." And that's pretty much what Lang does. He and his team take over the client's kitchen, prepare a five-course Italian meal (though smaller tasting menus are available), and pour regionally compatible wines with each course. While his staff serves, Lang asks the guests to tell him how the food and wine are working together—how a wine like the De Forville Dolcetto d'Alba, for example, from a Piedmontese winery where Lang once helped with bottling, might play off his wild boar sugo (a regional term for an Italian meat sauce). "People really get much more involved with what they're tasting," Lang says, "and it's an opportunity for them to join in on the conversation." And that, he points out, is something that almost never happens in a restaurant. —Patrick Comiskey, a senior correspondent for Wine & Spirits Magazine, also writes regularly for the Los Angeles Times.